KawaiiPunk - Kawaii Mascot Blog: Itasho Erasers! Making Mistakes Fun! Welcome to the wonderful world of Itasho Erasers! At Itasho Erasers they’ve managed to make the act of making mistakes, not to mention fixing them, a joyous occasion! 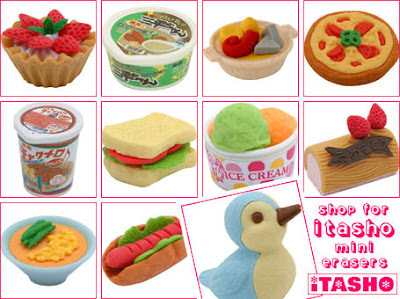 With amazingly cute erasers coming in all sorts of shapes, including burgers, fries, penguins, bunnies, biscuits, cakes and more, the good folks at Itasho could be accused of encouraging us all to make more mistakes! And I for one support them! After all, where’s the fun in getting it right all the time!